This article was published by "Boat International" magazine, in their June 2000 issue. In the spring of 2000, a glittering fleet of the world's most historic sailing yachts assembled in Antigua for the annual Classic regatta, where they were rewarded by a week of glorious sailing in blazing sunshine and solid Caribbean trade winds. Among such famous names as Endeavour, Mariette and Whitehawk, one particular yacht, the 32 m ketch Thendara stood out. With her owner Philip Swinstead at the helm, and a crew of 25 sailing her to the limit under the order of her captain, Jacques Louvet, she just managed to beat her old rival Mariette on handicap, winning both her own racing division and the Boat International Concours d'Elegance. This was perhaps the high point so far of a story that began in 1936, when Sir Arthur Young, one of Scotland's leading yachtsmen who raced International 8-metres, 6-metres and Dragons, asked Alfred Mylne to design him a large, seaworthy cruiser-racer. Completed the following year by Clydeside yard of Alexander Stephen & Sons, she was a very conservative design, especially compared to Sparkman & Stephens' Stormy Weather, which had already been sailing for two years, or Fife's Latifa, designed about the same time.This especially applies to her gaff ketch rig with topsails, a rather quaint sailplan for a time when virtually all racing yachts, including Britannia, had made the change to Bermudan rig. Thendara was the last of her vintage in more ways than one, for she was also one of the very last big cruising yachts built prior to the second World War. Her construction - teak planking on steel frames - was also deeply traditional but thoroughly well engineered and immensely strong. In fact her hull below the waterline was still sound in 1991, more than half a century later. Old-fashioned she may have been, but Thendara was certainly no slow coach as Mylne had given her a sweetlined and easily driven hull. With the owner at the helm, she won both her class and the overall prize at the Torbay Coronation Regatta in 1937. For three years she raced and cruised extensively, covering much of the West European coastline until the conclusion of the 1939 season, when hostilities put an end to all sailing. After the war, Young had her repaired and fitted out again, by which time she must have seemed a giant from another age as big yachting had died for the foreseeable future. Following Sir Arthur Young's death in 1950, Thendara was sold and disappeared to Greece and later Italy, where she slowly deteriorated with the passing years. In 1991, resulting from a change of ownership, Southampton Yacht Services (SYS) was asked to ship the yacht from Italy to England with a view to restoration. This it did, but contract negotiations proved fruitless and the deal fell through. Fortunately, Yacht broker Mike Horsley of Malcolm J Horsley then brought her to the attention of a European industrialist - already a classic yacht owner - who immediately saw the potential that lay beneath Thendara's shabby exterior. He therefore commissioned SYS to carry out a full restoration. Her hull was in poor condition, her rig was nothing like the original, and of her interior no trace remained.She had in fact suffered the fate of many big sailing yachts after the war, gradually going downhill in the hands of owners who could not afford the upkeep. It is only in recent years that the classic yacht fleet has been rescued by owners who are prepared to spend enough money to bring beautiful old yachts back to their former glory. Of course there is a continuing debate about whether old yachts should be rebuilt to a condition as close as possible to the original, restored with the appearance and style of the original but embodying some modern equipment, or refitted as modern vessels with a vintage look. It is easy to take a purist view if you are not paying the bills, but in reality much depends on what remains that is capable of being restored, and to what lengths an owner is prepared to go to recreate what has been lost. To give one example. Thendara had set cotton sails in 1937 and used hemp or Manilla ropes, none of which are available today. But, to create an authentic appearance, she now sets Dacron sails woven in special narrow panels and dyed to a pale creamy shade to imitate cotton, while all her ropes are synthetic fibre but of twisted three-strand construction that looks the real thing, rather than modern braidline. Although nothing remained of the original interior or rig, SYS was fortunate in that Thendara was well documented. For a start, the original plans were available through Ian Nicholson, who owns the Mylne archive, while Beken of Cowes was able to supply enlargements of pre-war photos of her sailing in the Solent. Many important details of layout and deck fittings were deduced from a priceless collection of "holiday snaps" loaned by Mrs Mary Burgess, a relative of Sir Arthur Young who had sailed on some of his pre-war cruises. Three designers produced drawings for the rebuild : Edwin Meayers planned the interior and drew perspective drawings of the main compartments, Midhsip Boat Services prepared the engineering and structural drawings, and Alan Boswell worked on the exterior drawings and naval architecture. Two major decisions taken at an early stage were to affect the final appearance: to provide every cabin with natural light and ventilation through opening skylights, and to rebuild the doghouse with a slightly less boxy appearance than the original while still providing full headroom. With a gentle slope forward, a cambered top and a combination of glazed and fielded panels, the new structure looks exactly right. By building skylights along the sides of the doghouse, it was possible to provide the required light and air below without obstructing the deck. When Thendara had been stripped out, it was found that most of the framing, in Dalzo rust-resisting steel, was in good enough condition to be retained, and the hull planking was still sound below the waterline. However long exposure to hot sunshine had done nothing for the topsides, while the stern had been fatally damaged in some long-forgotten crash. As a result, the top four strakes of 3.8 cm ( 1.5 inch) teak planking were renewed and a brand new stern was laminated from many layers of teak - a technique not available to the original builders. A completely new teak deck was bedded with epoxy onto a marine ply base, providing a much stronger and more waterproof deck than had been possible in 1937. There was never an objective to build an exact replica of the 1937 Thendara but every intention to follow the spirit as closely as possible. the modern yacht, for instance has a contemporary electrical and plumbing system as well as air-conditioning, all carefully fitted into the original engine space. Fortunately, the present-day Volvo diesel is much smaller than the Glenifer petrol/paraffin motor that once provided modest auxiliary power, making it possible to squeeze a pair of Northern Lights in hush boxes. Likewise the galley is completely state of the art with no attempt made to hide the equipment as it was hardly to be expected that food would be kept without refrigeration or cooked on paraffin burners these days. The accommodation is another story because the starting point was the need to provide a full-width owner's suite as well as two guest cabins, all three with en suite shower rooms. These were exquisitely built with Honduras mahogany, lightly stained and hand polished, with deckheads and bulkheads in pale cream, V-grooved planking. The full-width main saloon / dining room, with its large central skylight, beamed deckhead, raised and fielded mahogany panelling, and many fittings that are either original or careful copies of originals, is an absolute masterpiece. It is surprising that while many restored sailing yachts have throughly authentic-looking hulls and decks, owners seem to lose their nerve when it comes to the rig and fit contemporary looking spars that are nothing like the originals. This is not the case with Thendara, where everything has been kept as authentic as possible except as already pointed out, that modern materials have been used for the sails and lines. Harry Spencer of Cowes, who is one of the world's great experts on traditional rigs, built Columbian pine masts and spruce gaffs and booms, and rigged them with galvanised steel wire that is virtually indistinguishable from the originals. The SYS craftsmen went to extraordinary lengths either to salvage and repair existing fittings or re-cast new ones using the originals as patterns. At the same time, modern engine controls and instruments are carefully built into lockers so that they can be concealed when not in use. The same applies to modern navigational and communication equipment, which all disappears behind doors so as not to spoil the period charm of the doghouse interior. The original Thomas Reid anchor windlass was rebuilt using a hydraulic motor in place of the DC electric one, whose casing was carefully replaced. 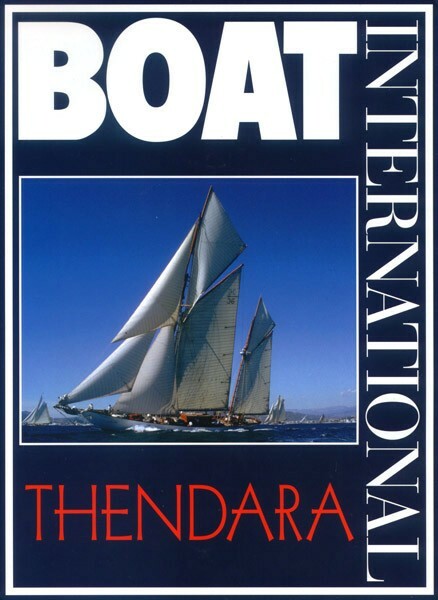 After she was relaunched in 1994, Thendara cruised widely and took part in a number of classic racing events culminating in the 1998 Atlantic Challenge, which the owner had particularly set his sights on. She did extremely well in this event, winning the prize for the gaff-rigged classic yachts. Afterwards her owner decided to move on to further challenges and put her on the market. After her present owner Philip Swinstead purchased her, he had already began to campaign Thendara seriously on the classic racing circuit but wanted to improve her performance by clearing up all the problems that had become apparent since 1994. Thendara returned to SYS during the early part of 1999. The biggest concern was that she suffered from very heavy helm forces, apparently because the large wooden rudder had been incorrectly altered at some time in the past and had warped. The massive blade was therefore replaced with one made of steel. At the same time the steering gear had become unacceptably worn and was renewed using original parts as patterns wherever possible. Five years of hard sailing including Atlantic crossings, have given Captain Jacques Louvet and his crew an immense amount of experience in handling Thendara and it is therefore no surprise that they had amassed a long list of things that could be improved. So while the yacht was in dry dock, the masts were pulled and Harry Spencer, who built them, gave the rig a thorough overhaul, incorporating many small improvements suggested by Louvet to reduce friction and improve performance. A number of original galvanised steel deck fittings had deteriorated and were replaced with identical ones made from bronze. the deck has been re-caulked, and the windlass received new bronze drum ends. The owner's wife is an interior designer, and she went to work below decks in an effort to produce a more genuine 1930's feel, incorporating some different fabrics and wood finishes. She added authentic period lamps and even period tableware and silver, to make the saloon and cabins as close to the originals as possible. Following her most recent refit, Thendara has continued to be very actively campaigned at classic racing events on both sides of the Atlantic. Today, she is without doubt the best-preserved yacht of her era and, given her current standards of maintenance, could easily continue to delight owners, crews and onlookers for a further 60 years.